We were lucky enough to have taken a trip to Colorado a few weeks back. Just so you get a sense of how nice people are there (general sweeping statement I realize) when we were checking out of the car rental place the gentleman at the window asked where we were headed. When we told him “Aspen” he recommended what he thought was the best taco shop ever. Right here in CO? We thought that was a little weird but we were completely entranced with the CO hospitality so we had no chance but to trust him. On the drive out of Aspen as we were returning to the Denver area we found the little taco shop Taqueria El Nopal in Glenwood Springs, CO. Of course it was tucked into a strip mall (the only thing we look for when seeking out culinary treats – no really, we do!). The place was packed. We ordered a ton of tacos to try, carnitas, carne asada, and vegetable. While we were waiting I helped myself to the salsa bar where there were at least 6 homemade salsas. I could have done shots of the salsa alone! The tacos arrived, and we especially fell in love with the vegetable tacos. I’ve made vegetable tacos before but my vegetables were always much larger than the ones at Taqueria El Nopal and cooked for much less time, I could just tell. So, this recipe is an experiment and a tribute to the best little taco shop in the states. Not that we entirely believe that, but we were in a euphoric mood so we’ll just go with that. I think you will find the crisp slaw is a nice contrast to the slightly sweet and very soft vegetables. The trick is to keep the vegetables all diced about the same size, very tiny. Want some more vegan love? Your search ends here. Prepare the slaw first so it has time to marinate. Combine the tomato, cilantro, jalapeño juice, vinegar, onion, and salt in a small food processor. Blend until almost smooth. Pour over red cabbage (in an air tight container), stir, and place in refrigerator until it’s time to eat. In a large pan (something with a lid), over medium heat, add olive oil. Once hot, add squash, zucchini, tomato, carrots, and garlic. Sautee for a 3 minutes, add water, reduce to medium-low heat and cover. Continue to cook, stirring occasionally, for 45 minutes. In last 5 minutes of cooking add hot sauce, and cilantro leaves. 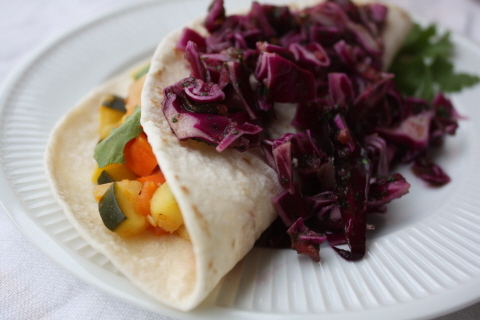 Spoon veggie mixture into tortillas, and top with desired amount of slaw.